If you love snakes, frogs and lizards, then you love reptiles and amphibians. Reptiles and amphibians are a lot alike. They both are cold-blooded. They can’t control their body temperature. Most reptiles and amphibians lay eggs. Some take care of their babies. Others leave the babies to fend for themselves. 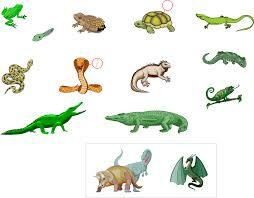 All About Reptiles and Amphibians: Some Reptiles and Amphibians. Most reptiles and amphibians are carnivores. Small frogs, lizards and turtles eat insects, spiders, slugs, snails. Larger snakes like rattlesnakes eat mice, lizards and rabbits. Really big constrictor snakes like boas and pythons can eat anything they catch – including deer, water buffalo and even humans. 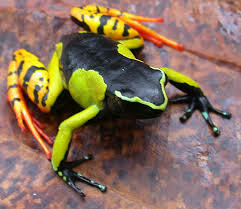 Some frogs are poisonous. Their skin contains a poisonous substance that can hurt any animal that tries to eat them. Some snakes are venomous. They have hollow fangs filled with venom. 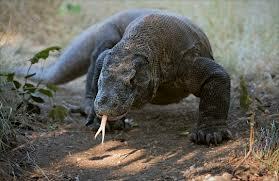 The Komodo dragon has bacteria in its mouth that can kill an animal that it bites. Amphibians and reptiles come in lots of sizes and colors. Some frogs are as small as your fingernail, while snakes can grow as long as a school bus. Turtles can live 100 years or more. 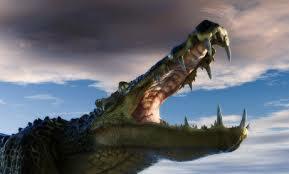 Crocodiles are related to dinosaurs. A video about the lives of amphibians. Question: Do reptiles and amphibians make good pets? Answer: These animals need special care and they’re not cuddly, but some people like to keep them as pets. Question: Are reptiles and amphibians helpful? Answer: Most of the time. They eat insects and mice that can hurt our farms and gardens. Enjoyed the Easy Science for Kids Website all about Reptiles and Amphibians info? Take the FREE & fun Reptiles and Amphibians quiz and download FREE Reptiles and Amphibians worksheet for kids. For lengthy info click here.